It’s not an exaggeration to say that millions of people around the world will take part in making Colorado Springs the epicenter of the motorsports world on Sunday during the running of the 91st Pikes Peak International Hill Climb when it roars up the fully-paved, 12.42 mile course with 156 turns at 8 a.m. (Mountain Time). Now you can watch the world’s most famous hill climb and America’s second-oldest motorsports race via live streaming over the Internet on Red Bull TV for the first time. The broadcast, plus live timing and results, is available by going to www.PPIHC.com and finding the link under “Follow Live” to join in the thrills and excitement. You’ll see “Watch on Red Bull TV” at the bottom of the television screen simulation. Last year, the PPIHC website received 8 million hits during the race, and with the Red Bull TV broadcast available this year around the globe, that figure will surely grow. 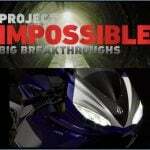 In fact, you can watch Motorcyle.com’s own Features Editor Troy Siahaan as he attacks America’s Mountain aboard a Zero FX! 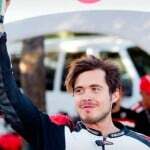 The “9 Minute Club,” all five competitors who have broken the once elusive 10-minute barrier will be in the race, including Carlin Dunne – who won the Pikes Peak 1205 division last year aboard a Ducati Multistrada S and will compete this year on a Lightning Motorcycles electric, which he used to beat even gas-powered bikes on tire-test runs earlier this week. But based on practice and testing times this week, the 91st running on Sunday may result in the first sub-nine minute mark and new records in almost every division. 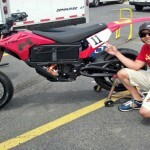 Motorcycle.com’s Troy Siahaan will be racing for the Hollywood Electrics team on a Zero FX. 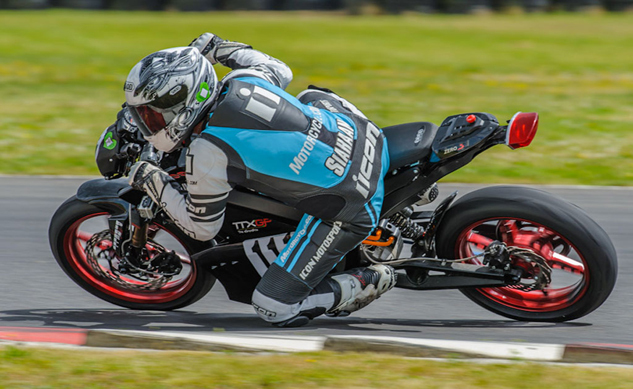 All other eyes in the motorcycle field (those not on Siahaan, of course) will likely be focused squarely on Dunne (left), who set the course mark for bikes last year with a clocking of 9:52.819. 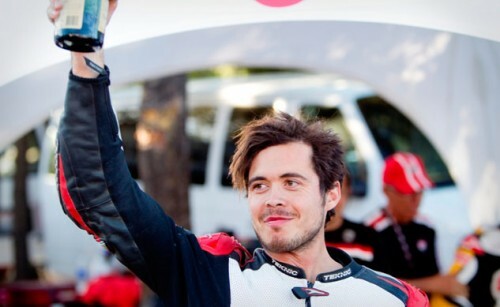 He’s back this year, but this time he will be racing a new Lightning Electric Super Bike, rumored to be the fastest production bike in the world, electric or fuel-based, in the Exhibition Powersports division, with an expectation of a new course record after his blazing testing times on the hill this week and last weekend. 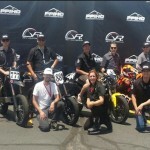 This will be the first year electric motorcycles will compete in their own division. 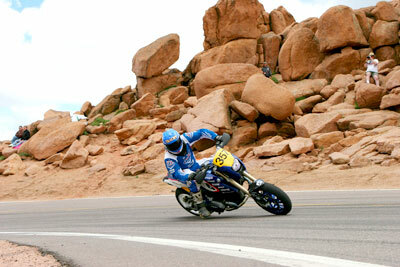 The eight division motorcycle field includes returning champions John-Thomas Wood (Adelanto, California) in the Sidecar division, Jason Archuleta (Colorado Springs, Colorado) in the Pikes Peak 250, Travis Newbold (Arvada, Colorado) in the Pikes Peak 450, and Marc LaNoue (Houston, Texas) in the Vintage division. Sunday’s forecast for Colorado Springs is a high of 82 degrees with a 10% chance of precipitation — but that’s for the city, not the course, which begins at 9,390 feet and ends at 14,110 feet at the mountain’s finish line. Fans will recall that the weather at the summit last year chipped in with hail, snow and rain in the late afternoon, with the last few divisions going back down the hill to a new finish line and a shortened circuit. Media coverage of this year’s Race to the Clouds has established a new standard for the race, which began very simply in 1916 by Spencer Penrose, founder of The Broadmoor Hotel, to bring attention to the city, the hotel and the dirt highway he carved out to the 14,110-foot summit of the Peak. Media covering the race will come from 20 nations: USA, China, Russia, Italy, France, Canada, Australia, New Zealand, Great Britain, Germany, Latvia, Portugal, Austria, Japan, Belgium, Mexico, Switzerland, Brazil, Croatia and the Czech Republic. In keeping with the race’s growing international reputation, the approximately 150 entries have been received from drivers and racers from the United States, Japan, Latvia, France, Sweden, Canada, Brazil, Great Britain, Hungary, the Czech Republic, Italy, Switzerland, Scotland, Poland, Korea and New Zealand. For more information, visit www.PPIHC.com.